If an effort to provide our customers more options during their shopping experience we have decided to start offering a selected number of effects pedals. The same criteria we used for selecting the cable and connectors we use was applied in the decision making process. We have selected rugged pedals with good reputations in order to offer you a good value. You will find examples of the brands selected on Todd's personal pedal board. 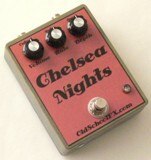 The Chelsea Nights is a simple to use, great sounding tremolo. Many tremolos have a perceived volume loss when engaged, but unlike other tremolos, the Chelsea Nights has a volume knob to offset that and give you the perfect level while on. As an added bonus, if you turn the Rate and Depth knobs to the minimum removing the tremolo effect, you can use the volume knob and turn your pedal into a gritty boost. Use it in conjunction with the tremolo to turn your sound into an overdriven tremolo. Rather than a standard LED indicator, the LED flashes at the rate of the tremolo effect. The Indigenous Donkey is a great clean boost pedal. This pedal is loud, gritty, and guttsy, yet it won't alter or color your guitar's tone. The 'Bass Cut' knob allows you to adjust the amount of bass entering the circuit in order to give you the cleanest amount of boost possible making it ideal for studio use. 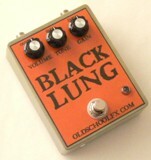 This pedal works best with a tube amp and increases the level of your guitar signal, improving the clarity and response. With the impedance so high, it forces your magnetic pickups to work harder, improving their clarity and response. Both highs and lows will seem more pronounced. Even when turned low, it may seem subtle, but as soon as you turn it off you will miss the extra sparkle and clarity. As the signal goes into the front end of your amp it causes the pre-amp to drive into a natural tube saturation sound with more sustain. The Invisible Robot pedal is a smooth, yet thick distortion that's loaded with sustain and rich harmonic overtones. 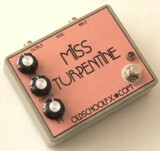 This pedal can produce great distortion and fuzz tones. It will give you that big fat chord tone that you've been looking for and at the same time, still gives you those amazing lead and solo tones you desire. It captures the distortion tone that defined the sound of the 70's and once again resurfaced in the grunge era of the 90's.